SuperCable® Iso-Elastic™ Cerclage system – a revolutionary polymer-based cerclage system designed to solve many of the inherent problems of traditional monofilament wire and cabling systems. KineMatch® Patello-Femoral Replacement – a unicompartmental joint replacement designed specifically for the small but challenging group of patients with isolated, end-stage patello-femoral disease. Kinamed is certified by the British Standards Institute (BSI) to be in compliance with the requirements of ISO 13485. Our certificate number is FM 75124. 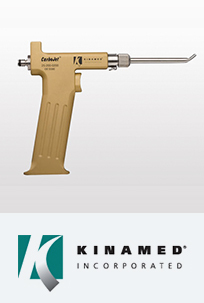 Kinamed is registered and licensed by the United States FDA, and the California Department of Health Services.